Usually, everyone has a theme in mind when planning their special event. Your wedding, sweet sixteen or reception could be a contemporary, eclectic, or traditional theme. 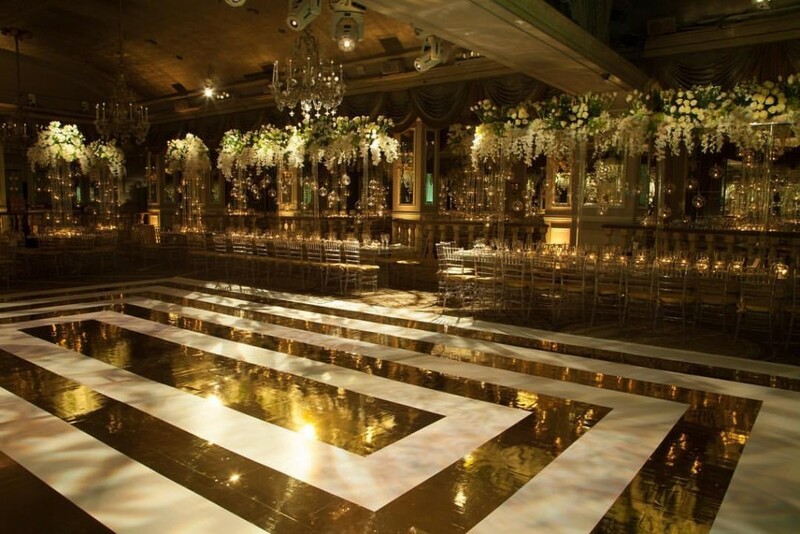 If you have a dance floor in the venue, you will want to ensure that it matches the theme and décor. At Bombshell Graphics, we can come up with a design that will go perfectly with the theme of your choice. If there are floral patterns on the napkins, tablecloths, and centerpieces, why not put that design on the dance floor? You can even personalize the dance floor to display the name of your event/party. A dance floor sees a whole lot of foot traffic, so you will need a dance floor decal that can stand up to the stress. The dance floor decals we use at Bombshell Graphics use a high-quality material, so the wrap does not tear or become removed while the guests are dancing on the floor. This means the floor will look as good at the end of the night as it did in the beginning. A common thought that comes up when having an event is, “I am only renting the dance floor, I don’t want to damage it!”. That isn’t something you have to worry about your event. Our wraps can be removed without damaging the dance floor. This means that if you have a floor wrap on a rented dance floor, you will not have to risk getting your venue deposit back. Make your special day stand out in everyone’s memories with a dance floor wrap. If you are thinking about having a floor wrap at your upcoming event, contact Bombshell Graphics and we will help you make the perfect day. Having a customized dance floor, as part of the overall decor for your event can be a great way to combine aesthetics and functionality. Bombshell Graphics will work closely with you throughout the design process, in order to ensure your vision comes to life. Our in-house graphic design team will work hard to transform your initial concept into a fantastic design. We have the high attention to detail and precision that is necessary for ensuring that you custom dance floor wrap design will exceed your standards. If you are looking for a great design to accent your event’s decoration, look no further than Bombshell Graphics. We take the initial concept and bring it to life, right on the dance floor. Our design team will be able to create custom dance floor graphics, decals, and wraps that are perfect for your event. To place a design order for your special occasion, give us a call at 862-210-8408 or fill out our form here. We provide custom dance floor graphics in Boston, New Jersey, Connecticut, Delaware, Hartford, Long Island, Massachusetts, New York, Pennsylvania, Philadelphia, Rhode Island, Virginia, Washington DC, Westchester, and nearby areas.